With the end of Apple’s WWDC keynote, the developer-facing event that generated a lot of buzz, several individuals now have access to the pre-release seed of iOS 12. The official line from Craig Federighi and Apple was heard with open years (regarding the iOS’s speed and performance improvements, but are they really true? Well, iAppleBytes went out of its way to see if it is by conducting a side by side speeding test. The videos mostly follow the same format. And, there’s no reason to change the format as it does the judging quite well and delivers results based on how the devices will be used in real life, albeit not always accurate. The existing public and stable iOS 11 version – iOS 11.4 – and the beta 1 of iOS 11 are installed on iPhone 8, 7, 6s, 6 and 5. The aim of to operate a number of tasks, including closing and opening applications in multiple runs, to know which iOS version can handle the test more efficiently and if iOS 12 brings with it any improvements in speed. 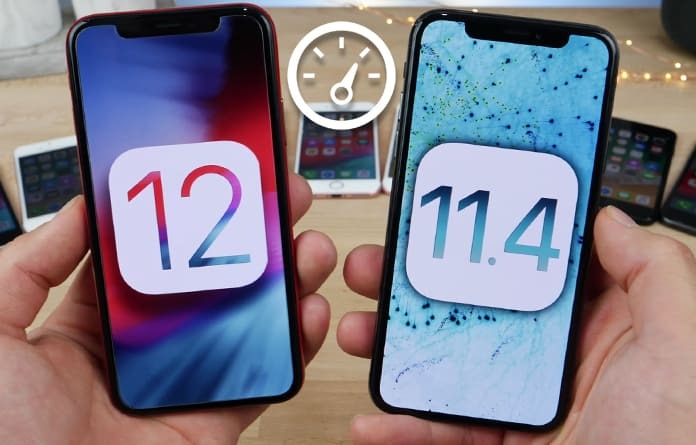 The side-by-side comparisons clearly show that speed improvements have been made in iOS 12 when it comes to overall speed and performance across a split of iOS devices. However, it doesn’t live up to the hype that iOS 12 is going to be twice as fast as former iOS versions. Yes, it is a PR-based that is being used because some processes in iOS 12 are significantly fast than iOS 11, but, in entirety, iOS 12 doesn’t put iOS 11 to the trash. That said, this is the first iOS 12 beta, so it is actually quite intriguing, and further betas might bring further improvements. In the upcoming months, we expect Apple to bring out new iOS 12 versions to developers as well as open the platform to public testers. Each release is expected to include incremental performance upgrades which should improve the overall stability of iOS 12 as well as its speed. We are waiting for those releases to be seeded, but, for now, enjoy these videos. Previous articleThe Home Button May Need Service – How to Fix?